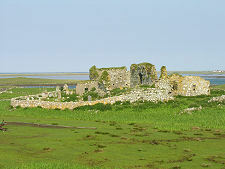 As the main A865 passes through Cairinis, near the southern end of North Uist, look out for a brown tourist sign directing you to a small car park on the west side of the road. 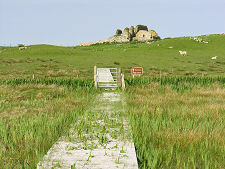 This is the start of a path that leads a little over a quarter of a mile to the remains of Teampull na Trionaid, or the Church of the Holy Trinity. As another tourist sign at the start of the path makes clear, this is also the location of Blar Chairinis or the Battle of Cairinis, fought in 1601. The tourist sign is subtitled Feith na Fala (ditch of blood), but no other information is given. 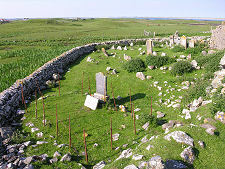 The Battle of Cairinis is said to have been the last battle fought in Scotland using only traditional weapons. 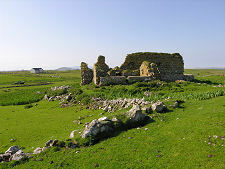 The resident clan at the time were the MacDonalds, and a dispute arose when one of them decided to divorce his wife, a MacLeod from Harris. The result was the arrival of a strong raiding party of MacLeods, and the battle seems to have taken place here because the MacDonalds were seeking sanctuary for themselves and their belongings within the precincts of Teampull na Trionaid. The battle was a victory for the resident MacDonalds, and the subsequent naming of part of the battlefield as the "ditch of blood" is an indication that few if any of the raiding party survived to see Harris again. The Book of Clan Ranald, written in the 1600s, says that Teampull na Trionaid was founded in the late 1100s by Bethag, daughter of Somerled. 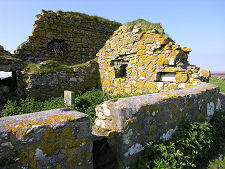 It was subsequently enlarged in the second half of the 1300s by Amy MacRuari, the first wife of John, Lord of the Isles, before being reconstructed in the 1500s. After the Reformation the church fell out of use, and despite stories of a continuing role as a school in the 1700s and the presence of sculpture within the church in the early 1800s, the church was in a ruinous state by the time it was visited by MacGibbon and Ross while compiling their Ecclesiastical Architecture of Scotland, published in 1896. There are references to Teampull na Trionaid having served as a monastery in its early life, and it is believed to have been an important centre of learning in the middle ages (and possibly until well beyond the Reformation). The early scholar John Duns Scotus, who lived from 1265 to 1308, is said to have briefly studied here. You reach the church across fields, with duckboard paths constructed over the marshy areas. Teampull na Trionaid is most impressive from the south, where the curved wall around the graveyard is complete. Access is through a gateway in the west end of the wall, and from here it is possible to enjoy the magnificent views offered by the slightly raised location set amid a very low-lying landscape. 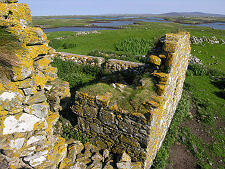 The main church comprises a rectangular building measuring 18.75m by 6.5m, with walls about 1m thick. The west end is best preserved, though all trace of decoration and all the facing stone throughout the church has long gone. 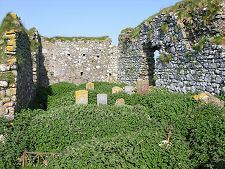 In summer the interior of the church, and many surrounding areas, are colonised by aggressive nettles: don't visit in shorts! 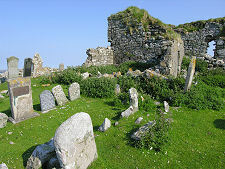 On the south side of the church at its west end is a ruined burial enclosure. Standing a little clear of the north side of the church at its east end is a separate, possibly later, building about half the length and width of the main church, and linked to it by a once-vaulted passage. We refer to it as the sacristy in the images. 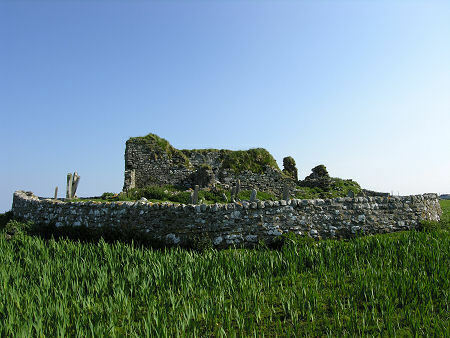 This is called the Teampull Clann a'Phiocair (Church of the MacVicars), a name probably resulting from the use by the clan of this area as a burial enclosure after the church had fallen out of use. 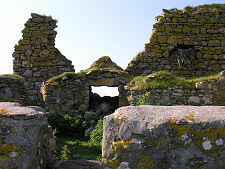 No wall encloses the north side of the church. 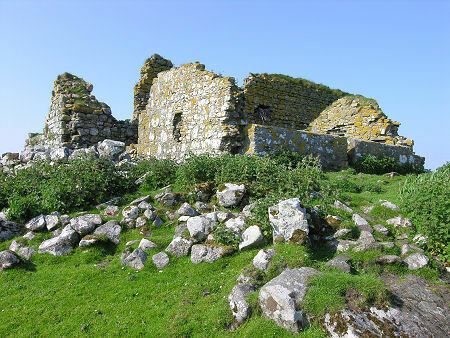 But there are more than enough nearby lumps and bumps, and nettle patches, to convince anyone with an even slightly active imagination that Teampull na Trionaid could once have formed the focus of a significant collection of buildings, giving more life and credibility to stories of an early role as a monastery or ecclesiastical centre of learning.